I don’t always like going to Zurich so much. Apart from the terrible traffic and difficult roads, a trip to Switzerland’s commercial capital usually means trading in sunny Basel for a gloomy dampness you don’t find on the bright side. Just getting out onto the lake gives everything a whole new perspective though. 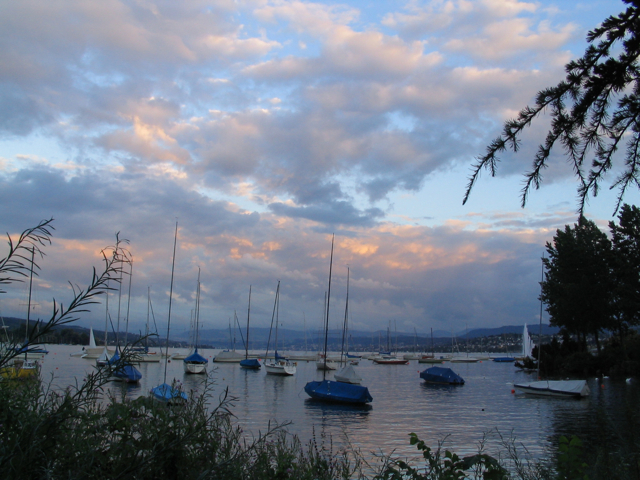 Whilst the lake does give Zurich a rather damp climate in winter, in the summer it adds a touch of glamour, even an air of carnival. Like a love parade: it’s still cool, but in a different way. The boat left from the harbour spot on time, in the normal Swiss way. No surprises there. After an hour of gentle steaming along the lake it seemed we were still in the middle of the town, the unbroken line of houses having followed us all the way unrelentingly, but at arms length. As the mountains got closer, so did the bank. We weren’t in Schwyz yet, this was the lakeside bank but the diamonds still shone on the bright side. 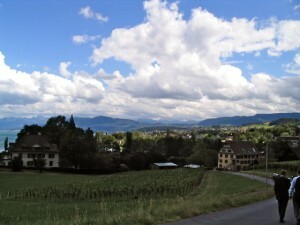 Ahead of us lay a stiff 15 minute walk up the hill, then down the other side through the vineyards to the Weinbaumuseum at Au. Strange name for a place, Au. Not quite in Schwyz, perhaps the locals still wanted the glory of reflected riches when using the Atomic shorthand for gold, originally from the Latin “Aureus.” Or maybe they were taking the old Swiss word Au meaning a damp, wet meadow at the top of a hill… Since we were at the top of a hill, and following Swiss tradition there wasn’t a mountain of money in sight, I guess this is the more likely explanation. 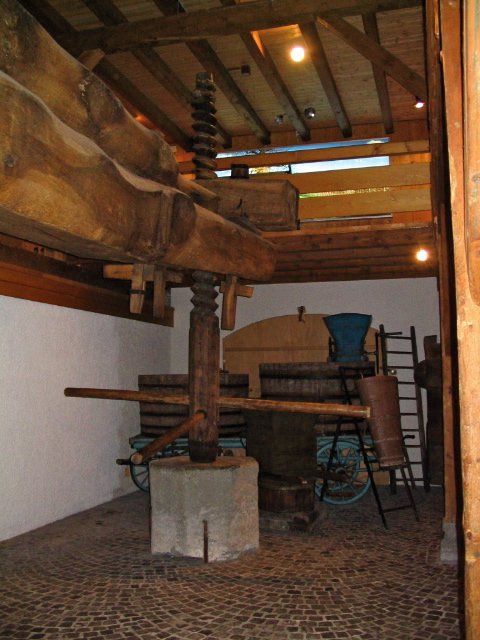 The old museum has some interesting stuff in it, including an enormous wine press weighing 8 tons made from the trunk of a single, massive tree and dating from 1761. 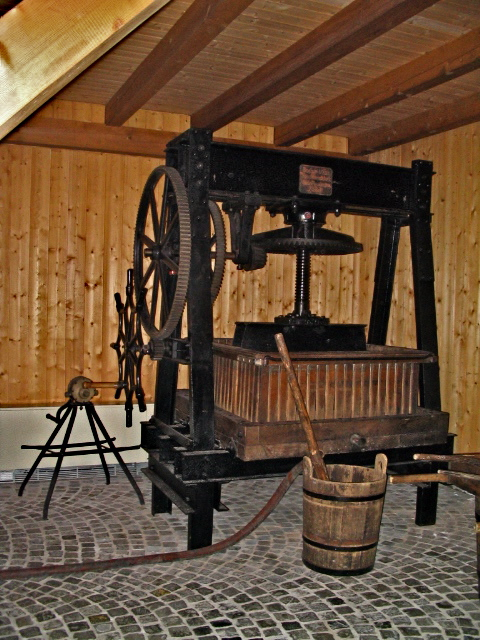 It took four sturdy men all their strength to turn the screw that crushed the grapes to extract the juice that would turn later into wine. 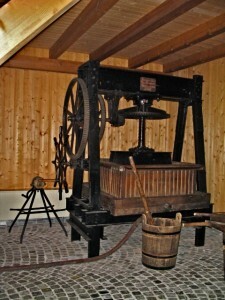 They used dark skinned, white fleshed grapes to make white or rose wine. 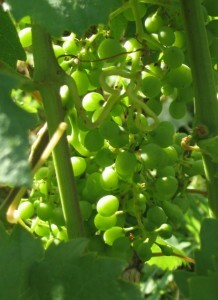 Red wine comes from the exact same grapes, but here the grapes aren’t crushed, just trampled. No wonder red wine has more body – or should I say bodies? With a total of over 800 different individual aromas, some wine has obviously gained a few aromas not present in the original grapes… from somewhere! 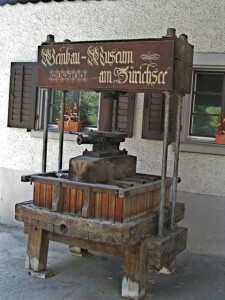 Even though the guided tour was in German, I could follow it quite well to begin with. Sadly they have no leaflets or other materials in English. I know they talked about America quite a bit, and of course England too. You probably already know that the American connection was the sturdy and disease resistant American vine roots to which modern growers graft their old world vinestocks. Strength and nourishment from the Americas, the tasty fruit giving us the “good stuff” from the old world. Things don’t change, do they? Well actually, they did not so long ago. 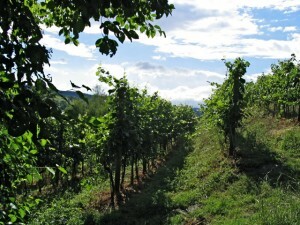 Some Americans decided they could get more productivity from their vines by growing the old world vines on old world roots, not on the grafted and less productive native species. But where does England fit into all this? Surely not into a story about wine? Well, back in those days a couple of centuries ago it was British technology that ruled the world, and without it the French could not have produced any champagne at all. The British climate was lousy for winemaking. But very good for encouraging people to find ways to keep warm. All that demand for windows that didn’t break meant the English became very good at making glass strong enough to resist high pressures. 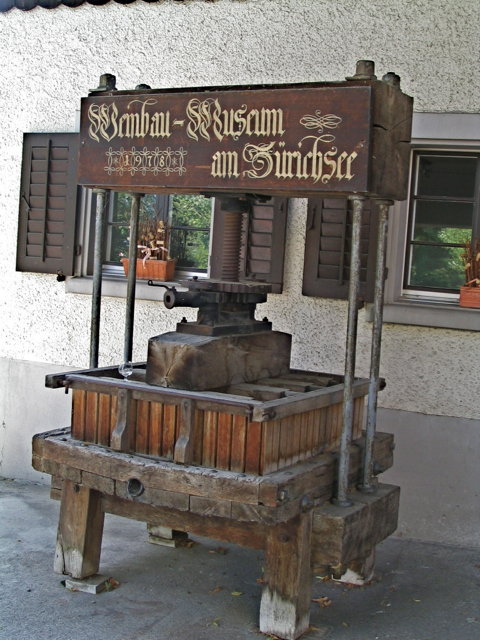 Pressures such as those generated by wine still fermenting in the bottle… you see the connection now? Without English bottles, there could not have been any champagne for some decades until the French caught up in this area. The talk finished with a wine tasting of the locally produced white wine. Actually it tasted rather like an English wine I know – not very good and a bit too acidic for my palate. This certainly hadn’t been made in 1761! 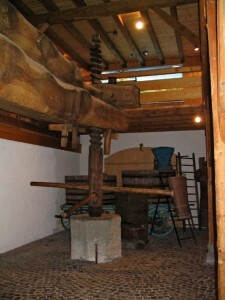 After a little while walking around the place exploring the many and varied tools, machines, pictures and exhibits it was back to the boat and on up the lake towards the mountains. Schwyz beckoned. You could see the Cantonal boundary quite clearly. For many kilometres the lakeside had been one huge housing development. It gave “Millionaires Row” an altogether different meaning, although they mostly had sailing boats and probably didn’t row at all. Along this stretch of the lake there were very few houses at all, even up the hill a bit. 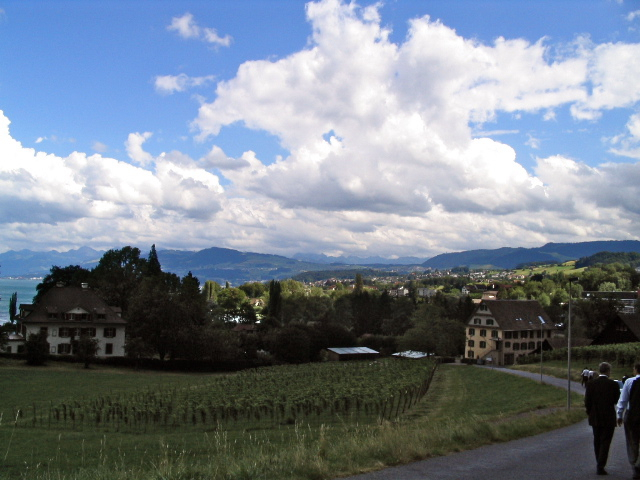 And then there was suddenly such an intensity of new house building and density of houses built that it was clear we had reached the low tax capital of Switzerland – Canton Zug. Time to turn around. We’d had the rather delicious buffet main course, and now we were headed back to Zurich for our just desserts. No diamonds for us then, unless you looked on the bright side. The setting sun glinted on the water. Dead on time, to the minute and in time for sunset, we were back in dock, but not actually in *the* dock, despite the lure of all those riches. Like the diamonds on the bright side, it all depends on your sense of perspective, see. 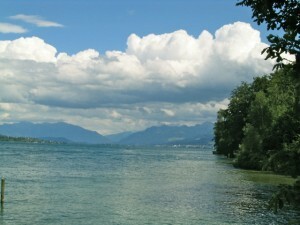 Zurichsee. It’s a nice place to be taken for a ride! Wonderful page full of detailed descriptions.Pretty pictures.